How many of you, like me, have had tissue boxes in your car that were smashed beyond any usefulness long before the tissues were used up? I don't have that problem any more! Thanks to Miss Mildred, I have a new tissue basket for my car! It holds a square size tissue box perfectly. 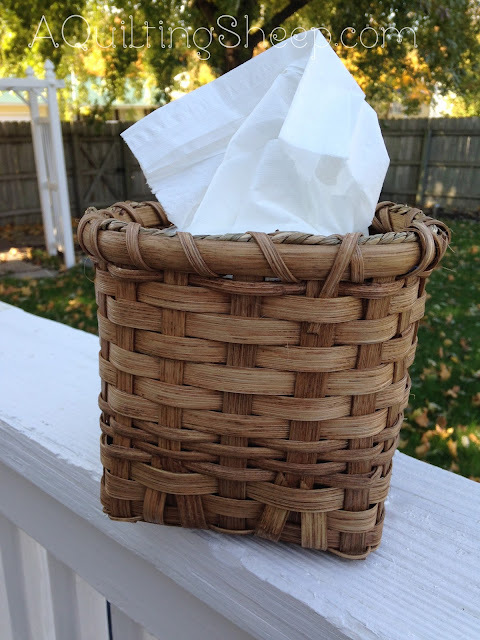 Just snug enough that when you pull out a tissue, the tissue box stays put inside the basket. Cool idea, huh? =) The quality of my new basket far exceeded my expectations. It is sturdy and so very finely made. Simply put...it is perfect. You won't find my exact basket in her shop because mine is a custom request. I am sure Miss Mildred would be very happy to make you one, too. That is really cute, and a great idea! Thanks for sharing! Your basket is so pretty. She really does a great job, and what a great idea. Thank you so much for sharing.